Do more than inform, engage. At least 1 in 5 visitors to your website is using a mobile device, such as an Apple iPad, iPod, or Android smartphone. Does your website provide the best experience for them? Website visitors who have a better experience on their device of choice engage more with your website and find what they need faster. 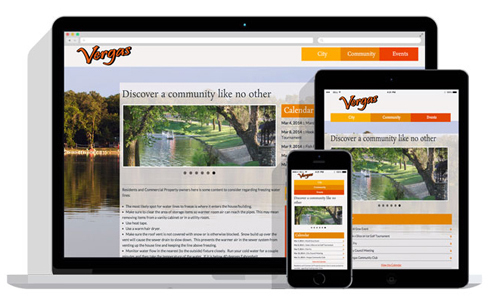 A CityCMS™ website with fully responsive design can get more people to engage with you city. Now you can know exactly what people are doing on and with your site. CityCMS sites automatically include Google Analytics, which includes referral tracking, page views, and visitor behavior analysis. Our designers can even track what links visitors specifically interact with. Have an online form that no one uses? Our form engine automatically integrates with Google Analytics and we can tell which question is preventing visitors from completing the form. Knowledge is power and CityCMS provides it. Visitors love search engines, and CityCMS loves search engines. CityCMS automatically generates sites maps and feeds for search engines to know exactly what is on your site. The links to your pages are full of keywords that help search engines, and your visitors, find what they need quickly. Not only is CityCMS is a great way to edit your own website, but it includes a powerful blogging tool, calendaring software, web form manager, and email marketing software. Your subscription to CityCMS can save your city actual budget dollars by consolidating communication services and tools. We use CityCMS for our website, and we know all the tricks and hidden gems. From HTML code to tips on features you may not have been fully using Our Professional Services team is here to help you get your message where it needs to go — your constituents.